You probably don’t think too much about your tongue during the day; however, it is actually a very important muscle in your body. Without your tongue, you wouldn’t be able to talk about your favorite television show with your co-worker, or swallow and taste your food. Because your tongue is such an integral part of your mouth, it is important that you take daily measures to keep it clean. Your dentist in Topeka shares what you should know about keeping your tongue clean and healthy. Just as bacteria builds up on your teeth, it also builds up on your tongue; in its grooves to be more specific. 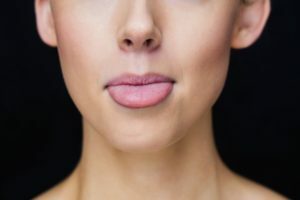 Papillae are tiny bumps that cover the surface of your tongue, and in the grooves of these bumps bacteria and food particles can collect, resulting in bad breath or a white discoloration of your tongue. Bacteria that gathers on your tongue can also transfer onto your teeth and gums, increasing your risk of developing issues such as tooth decay or periodontal (gum) disease. There are two ways in which you can properly keep your tongue clean: scraping and brushing. Brushing can be done after you finish cleaning your teeth. Gently scrub your tongue and other soft tissues with your brush before you rinse it off so it still has toothpaste on it. This helps remove bacteria and freshens your breath. You can also purchase a tongue scraper from your local grocery or drug store. This device glides along the surface of your tongue and removes the layer of mucus covering it and the bacteria hiding in it. Move from the back of your tongue forward with the scraper using a light and even pressure. You should brush or scrape your tongue once daily as part of your normal oral hygiene routine. This will keep it clean and free of bacteria, while also giving you fresh breath. If you have additional questions or concerns about cleaning your tongue, your dentist in Silver Lake is happy to answer them or schedule your next visit. Dr. Michael E. Michel has been providing high quality dentistry to patients in Topeka and Silver Lake, KS for nearly 40 years. With a focus on providing high quality dental care in a friendly and compassionate environment, patients feel right at home no matter which location they choose. Would you like to contact Dr. Michel? He can be reached by calling 785-273-0801 for our Topeka location or 785-582-0185 for Silver Lake. He can also be contacted through our website.